In honor of February’s Heart Health Month, try this recipe from our friends at America’s Test Kitchen that will excite your taste buds and keep your cardiovascular health in check. A win-win! 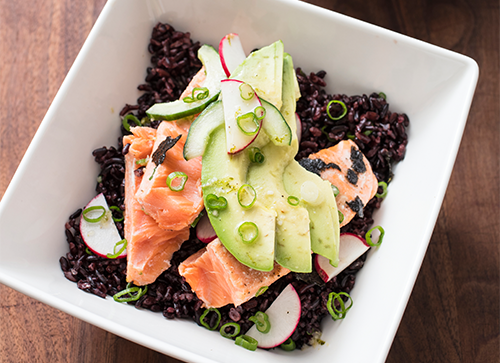 This Japanese style dish includes fiber-rich black rice, topped with heart-healthy salmon and avocado, along with fresh radishes, cucumber, and scallions. Bring 4 quarts water to boil in Dutch oven over medium-high heat. Add rice and 1 teaspoon salt and cook until rice is tender, 20 to 25 minutes. Drain rice and transfer to large bowl. Whisk vinegar, mirin, miso, ginger, and lime zest and juice together in small bowl until miso is fully incorporated. Season with salt and pepper to taste. Measure out ¼ cup vinegar mixture and drizzle over rice. Let rice cool to room temperature, tossing occasionally, about 20 minutes. Set remaining dressing aside for serving. While rice is cooking, adjust oven rack to lowest position, place aluminum foil-lined rimmed baking sheet on rack, and heat oven to 500 degrees. Pat salmon dry with paper towels, rub with oil, and season with salt and pepper. Once oven reaches 500 degrees, reduce oven temperature to 275 degrees. Remove sheet from oven and carefully place salmon skin-side down on hot sheet. Roast until center is still translucent when checked with tip of paring knife and registers 120 degrees (for medium-rare), 4 to 6 minutes. Portion rice into 4 individual serving bowls and sprinkle with some of nori, if using. Flake salmon into large 3-inch pieces. Top rice with salmon, radishes, avocado, and cucumber. Sprinkle with scallions and drizzle with reserved dressing. Serve, passing remaining nori separately.